Full sun to partial afternoon shade, with excellent air circulation. A hardy perennial from the Mediterranean, lavender will survive winter temperatures to 0F/-17C. Not generally needed beyond annual topdressing with rich compost in spring. Rose, Rosemary, Sage, Mint, Agastache, Apple, Cherry, Peach, Pear and Plum. Colourful petunias, nasturitums or other annual flowers that contrast with lavender’s gray-green foliage and blue flowers. Start with a purchased plant, or start seeds indoors and set out at about the time of your last frost. Some strains are propagated only from rooted cuttings. A mature clump of lavender will grow to 24" (60 cm) wide. Try different strains, and even species, to find the right lavender for your climate. 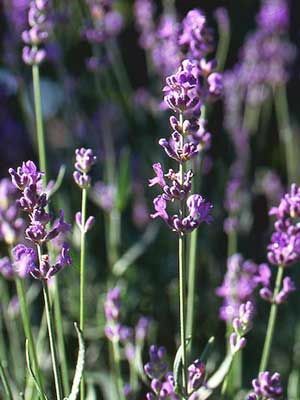 Lavender demands excellent drainage, and benefits from dry, airy conditions. Gather spikes of lavender flowers as soon as they open, and dry in small bundles before storing in an airtight container. You can also dry lavender branches for use in recipes, sachets or potpourri. Wait until spring to prune back lavender plants, because the dead stems help shelter the base of the plants from harsh winter weather.